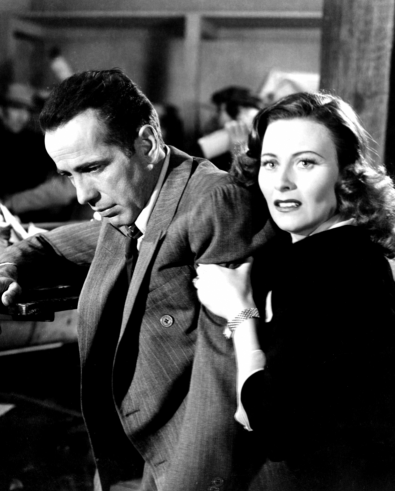 This review was originally published in 2006 as part of a piece on the second Humphrey Bogart Signature Collection. As Across the Pacific [review] was a bit of a reunion of the principles from The Maltese Falcon [review], this fantastic wartime picture brings together many of the players from Casablanca: Bogart, Peter Lorre, Sydney Greenstreet, Claude Rains, and director Michael Curtiz. Passage to Marseille is a real surprise. 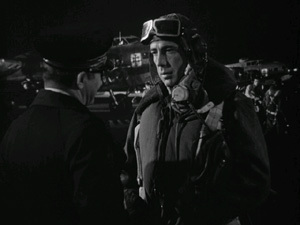 Screenwriters Casey Robinson and Jack Moffit, adapting a novel by Charles Nordhoff and James Norman Hall, have created a complex story about the Free French Air Corps, a squadron of French patriots who escaped the Nazi-occupied country to carry out operations from a secret base in England. The tale is constructed as a series of narratives within the main plot. A reporter visits the farm where the squadron sets up shop, hiding their planes in barns and their equipment under haystacks. Captain Freycinet (Rains) begins to explain to him how the group came to be, but instead he veers off into an off-the-record story about five soldiers who he encountered while sailing the ocean on his way to Marseille with supplies. The boat picked up a canoe full of men who, as it turns out, are convicts who escaped from Devil's Island to enlist in the French army to fight off the Nazis. The men explain to Freycinet how they came to their predicament, and the story of their escape also includes the story of Jean Matrac (Bogart), the leader of this small band who had been a crusading reporter in France in the period before the war when the Germans were starting to move in. For daring to speak out against his country's capitulation to foreign powers, he was sent to the prison colony on trumped-up charges, forced to leave his new wife (Michéle Morgan, The Fallen Idol [review]) and the ideals he once held dear. By the time Matrac ends up on the boat returning to France, he has lost faith in his nation and is lying when he says he is willing to fight for it. Through attacks by the self-important French officer Major Duval (Greenstreet) and a Nazi fighter plane, Matrac rediscovers what made his patriotism so important. Before they reach Marseille, however, the crew learns that the Nazis have taken over the country and so divert their course to England rather than give the enemy their cargo. This takes us back to the farm and the reporter, and an ending that is cynically realistic while stoking the flames of patriotic pride. Passage to Marseille is an awesome film. Curtiz has complete control of his production, never losing his audience no matter how far into the flashbacks he goes. 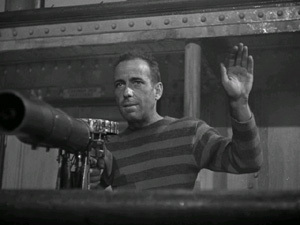 Bogart is hard-edged while also being heroic, and his now familiar compatriots back him up excellently. Lorre displays particular relish as the pickpocket Marius, slyly fetishizing his own crimes while staying true to the bond between his fellow escapees. The action scenes on the boat are exciting and violent, and the hidden headquarters of the Free French Air Corps is cleverly put together. Passage to Marseille naturally doesn't rate as high as its more famous predecessor, but it does prove that Curtiz and Bogart could beat the odds and capture lightning together more than once.